The public are now voting between 11 different proposals for the design of the central part of the complex. In the picture: Nová Zbrojovka project. Credit: CPI Property Group. 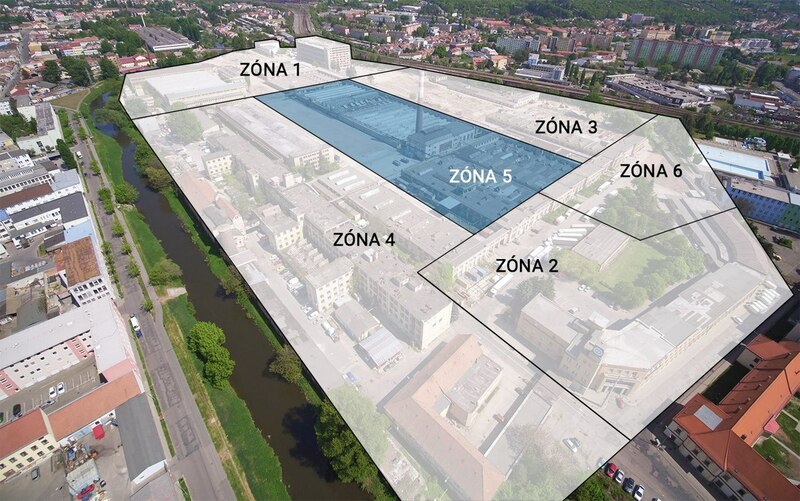 Brno, Jan 19 (BD) – Zone 5 covers the area at the centre of Nová Zbrojovka, the 22-hectare planned redevelopment of the former Brno Armoury [“Brno Zbrojovka”] complex. The zone borders all the other zones and is intended for use as a central public space. Architects submitting proposals for the new design of Zone 5 were asked to consider the preservation and possible future repurposing of the former boiler room and chimney in the centre of the zone. The specification also requested an “optimal, versatile and functional mix for this zone, consisting of residential, administrative and commercial areas, complemented by public and leisure areas,” creating a central district that provides a natural transition between all the other zones. “We received more than 800 votes and important comments on the proposals for zones 1 and 6. As we have 11 architectural visualisations, we expect that figure to be even higher,” said Zdenek Havelka, CEO of the project developer, CPI Property Group. Members of the public can vote on the website for the project. The proposals can be viewed until the end of February at Zelny Trh 13, on the ground floor of the City Architect’s Office. Nova Zbrojovka Brno, Zone 5 by CHAPMAN TAYLOR s.r.o. Nova Zbrojovka Brno, Zone 5 by AiD team a.s.
Nova Zbrojovka Brno, Zone 5 by Jakub Cigler architekti, a.s.
Nova Zbrojovka Brno, Zone 5 by KUBE s.r.o. Nova Zbrojovka Brno, Zone 5 by Kuba & Pilař architekti s.r.o. Nova Zbrojovka Brno, Zone 5 by K4 a.s.
Nova Zbrojovka Brno, Zone 5 by CMC architects, a.s.